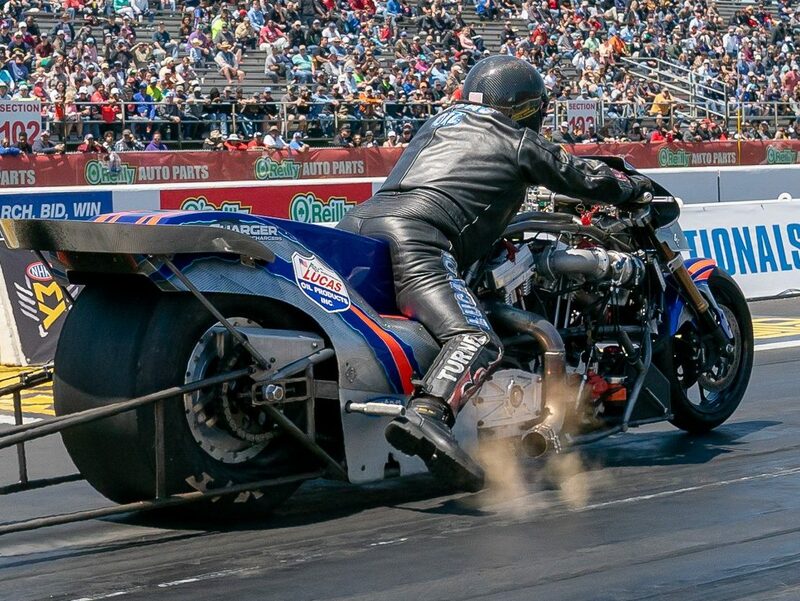 Multi-time Top Fuel Harley champion Jay “The Bulldog” Turner added another impressive accolade to his resume at the NHRA Spring Nationals from Houston Raceway Park, April 12-14. The Bulldog scored his first win on his brand new, state-of-the-art, Pro Charger, Lucas Oil-backed supercharged Nitro Harley. The trip to the winner’s circle was especially gratifying considering the more than two years of work that has gone into the new machine. Turner becomes the first to win the class with a blower bike since Jason Pridemore won Norwalk in 2016. Turner got off to an auspicious start by taking the pole in Q2 with an impressive blast of 6.18. On race day Turner motored past Billy Jackson, 6.29 to 6.75, point leader Beau Layne, 6.88 to 8.93 and teammate Mike Scott, 6.79 to 7.02. Turner says the new bike is bigger and heavier but definitely has more power.